Seven-year-old Safa guards her family's World Food Programme boxes by sitting on top of them, in Sulaymaniyah, Iraq. If the upcoming launch of the 2015 humanitarian response plan for Iraq by the United Nations and partners fails to raise the required $500 million, the people of the country, especially those internally displaced by fighting, will face even greater hardship, a World Health Organization (WHO) official warned today. “There are three strategic aims for health assistance: ensuring that both preventive and curative health services are available to all IDPs (internally displaced persons); maintaining the supply chain of essential and life-saving medicine to all health outlets; and ensuring effective preventive measures,” explained Dr. Jaffar Hussain, head of WHO operations in Iraq, during a press briefing in Geneva. Of the total $500 million that will be requested to cover humanitarian needs in Iraq through the end of the year, health partners will ask for $60 million, which includes $22.5 million for WHO assistance only, he added. The Plan will be launched on June 4 in Brussels. 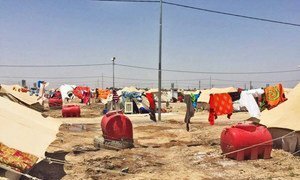 “The scale and scope of conflict in Iraq has expanded and the situation is very challenging due to massive displacement since June 2014 and its effect on the host community,” he said. Initially confined to the north of the country, the displacement has now worsened, with between 2.1 and 2.3 million IDPs moving quickly in the last two weeks in the central and southern parts of Iraq, due to attacks on Ramadi, the capital of Anbar Province, by Islamic State in Iraq and the Levant (ISIL) insurgents. This situation has exacerbated the vulnerability of the IDPs to communicable diseases, particularly measles, hepatitis and other water-borne diseases, which makes it a priority to adopt preventive measures such as disease early-warning systems, immunization campaigns, health promotion and education, care of patients and support to hospitals, the official recommended. “With the arrival of summer and temperatures above 50 degrees Celsius in the southern and central parts of Iraq, WHO is very concerned about the risks faced by IDP populations and their extreme vulnerability to outbreaks, including cholera and hepatitis,” Dr. Hussain pointed out, recalling that his organization is already treating numerous patients with chronic diseases without the necessary infrastructures and health personnel. Most of them fled the insurgents. A number of grants have allowed WHO so far to provide prefab and mobile health clinics on the ground, as well as a strong supply chain of vital medicine and items to all IDP locations. However, that money will run out by the end of June, the WHO representative underscored, a situation that makes the success of the Humanitarian Response Plan of a tremendous importance for the well-being of the Iraqi people. At least 1,031 Iraqis were killed in May 2015 and another 1,684 injured in acts of terrorism, violence and armed conflict, according to the United Nations Assistance Mission in Iraq (UNAMI), which said the actions of the Islamic State in Iraq and the Levant’s (ISIL) were to blame for the growing number of casualties.